Science In Motion is the Newton Running Co. motto, and I can see why. There is definitely something scientific going on with their shoes. Anxious for some extra off-season fitness, I treated myself to the Terra Momentus trail running shoe. My first impression: Wow! This is not your average footwear. The Terra Momentus feels different and, upon further examination, it really IS different. Run barefoot to discover your optimal running form. You’ll discover immediately that when you run barefoot, you’re not landing on your heels. Instead you are landing on your midfoot/forefoot. Landing on your midfoot/forefoot is the most natural way to run. It is also the fastest and most efficient way to run. 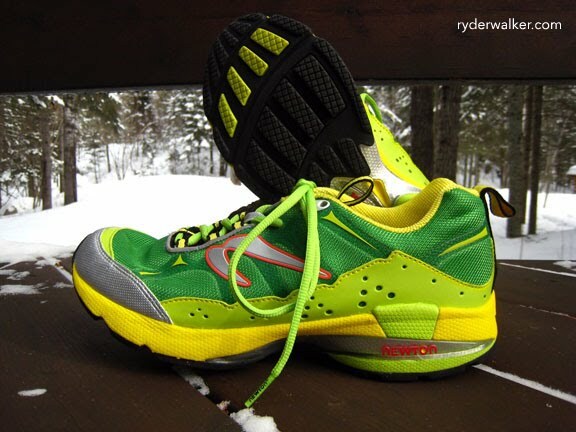 Newton Running shoes are the only shoes that were developed specifically for Natural Running. The secret to these shoes lies in Newton’s patented Action/Reaction technology. (Click the link to see how it works). Marketing hype or the real deal? It’s still too early to tell, but I will say this. I love these shoes so far. I feel like I could run twice the distance I could before. I don’t get any of the jarring and pounding that I get from other shoes and, overall, my legs just feel more aligned and efficient. It sounds cheesy, but I feel like these shoes actually make running easier. I should also add that I stumbled upon Newton only after trying multiple pairs of “traditional” running shoes. I’m not a student of Chi,Pose, Evolution or Barefoot running. I just like to get out and run, hike, ride, and explore. That said, Newton felt the best on my foot. They felt so good, in fact, that I’m excited to run more often. Dare I say it? These shoes actually MAKE me want to run. As for initial observations, I have a few. 1. The actuator lugs beneath the forefoot might take some getting used to. The shoes feel like they have cleats, so walking in them feels similar to walking in clipless bike shoes. As a cyclist, I’m used to this sensation. A non cyclist might find it strange. The lugs also change the alignment of your foot and ankle. You can really burn up your calves if you don’t ease your way into these shoes. Newton recommends a two week transition period with light intensity and short distance. 2. The shoes threw me forward, if ever so slightly, when I first jumped on the testmill. I’m a midfoot/forefoot runner to begin with, but these shoes still affected my body position. If you tend to heel strike when you run, you’ll probably feel more of an adjustment than I did. 3. The Terra Momentus is Newton’s trail runner, but I’m skeptical of this shoe’s performance on steep, loose, uneven mountain descents. As Newton is a Colorado-based company, I wouldn’t expect this to be in issue. That said, it just doesn’t seem like these shoes have as much footprint, (purchase), as other shoes on the market. Some online reviews confirm my suspicions, but the jury’s out until I can put them to the test. 4. The florescent green grows on you. I just started putting miles on these shoes. Expect a more detailed review in the coming weeks. Thanks for the great explanation of Newton Running shoe technology and your feedback on the Terra Momentus. Good luck with the training!